With websites like Etsy and Houzz the internet is a wash with creative souls getting out their dirty clothes and making stuff. One of the most popular it seems is concrete flower pots in tiny incarnations with succulents and cacti nestled inside. 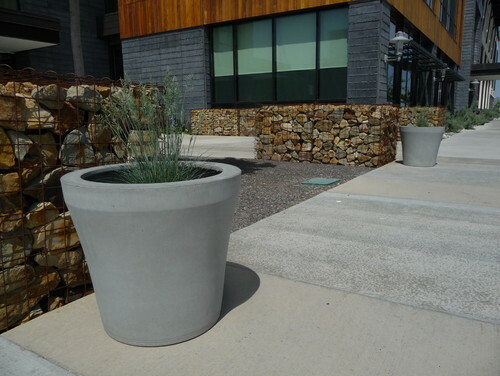 They weren’t the first though as concrete has long been used for flower pots due to its strength and durability. In recent times though concrete has developed an image of style and class with many top designers and architects using it in their ideas. 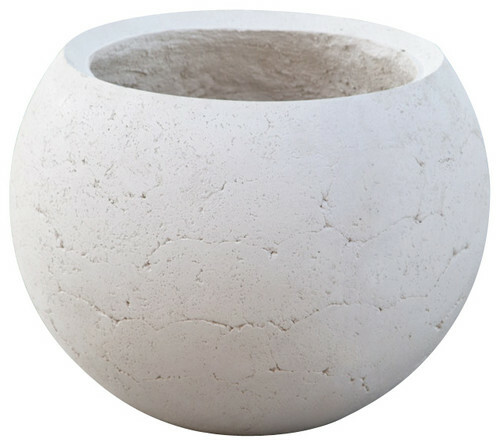 There are now a few companies that make stylish planters but use this old school material to give it a designer edge. I obviously have to highlight my Kronen 65 as one of my offerings to the concrete ceramics party. 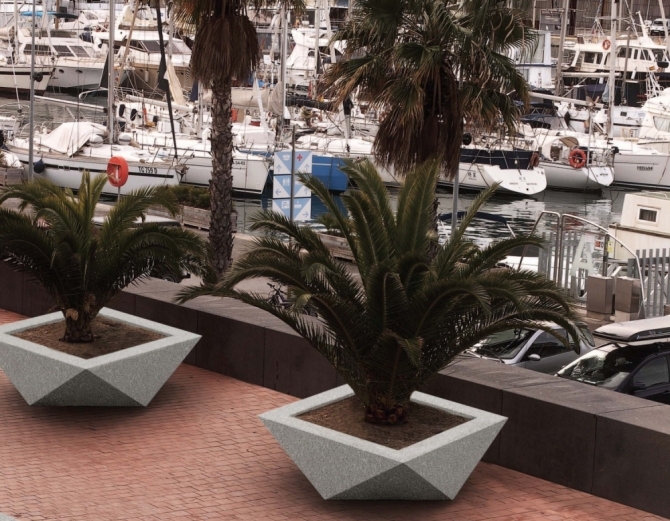 The design is inspired by the fashionable origami style in Danish design at the moment and aims at the higher end of planters. 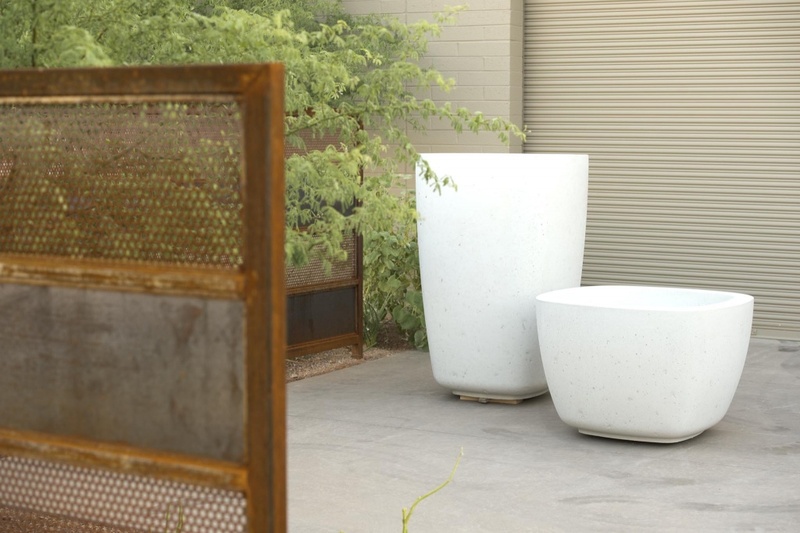 These concrete planters from Metalco are a modular system where you bolt the panels together to meet what ever size suits your requirements. It’s a clever idea and enables the company to offer good flexibility with their box planters. Adding the scaly detail on the side gives it some identity over the rest so over all these are a nice touch. Femkant is a more tame approach to the origami theme using bigger triangles to create a less sharp form. The overall form is suitable for the same sorts of application as box planters but it gives a more interesting alternative. 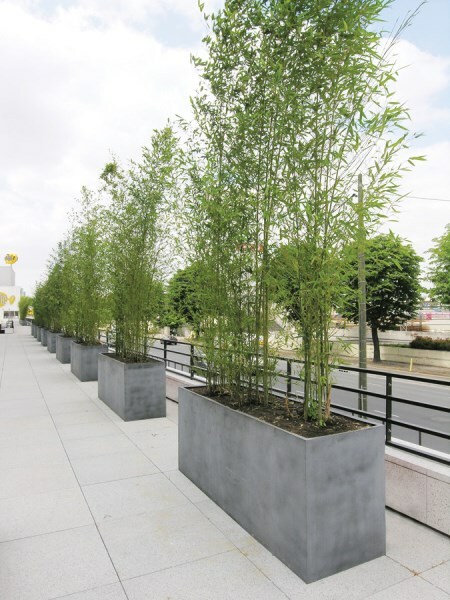 Landscape forms are retailers of outdoor public space products and part of their offerings are these pre cast planters. Those of you who are in the know may well recognise the design language as Larry Kornegay’s and you would be right. These are his designs which have been commissioned by Landscape Form so they are great for commercial installation with very thick and hard wearing walls. Following the origami theme these square designs will obviously allow the designers to fit the planters next to each other much easier than my own but there is something about a square that is less interesting than a shape with more side. Maybe I am biased or maybe it’s because we see so many squares. These are somewhere between the concrete and GRP lines as they are GRP but made to look concrete. This makes them more logistically feasible as they are light and can fit on a pallet easily and crucially they are inoffensive in design so you can’t go wrong. My equivalent offering are these. My cube 50 was and remains a concept, taking the usual box design and giving it a small design touch with oak feet the flower pot definitely had a nice edge over the competition but for this shape there is so much of it. It is hard to see from this photo exactly how big this planter is, to me it looked very small with the wall thickness being deceptive. However with a price tag of $1600 it can’t be. If you click the image then it will take you to other pictures of it in situe and you will see it is larger than it first appears. What I like about it is the marbled surface and hand made feel, it looks very limestone/Italian marble.